If there's any Canadian city that can give Toronto shopping a run for its money, it has to be Montreal. 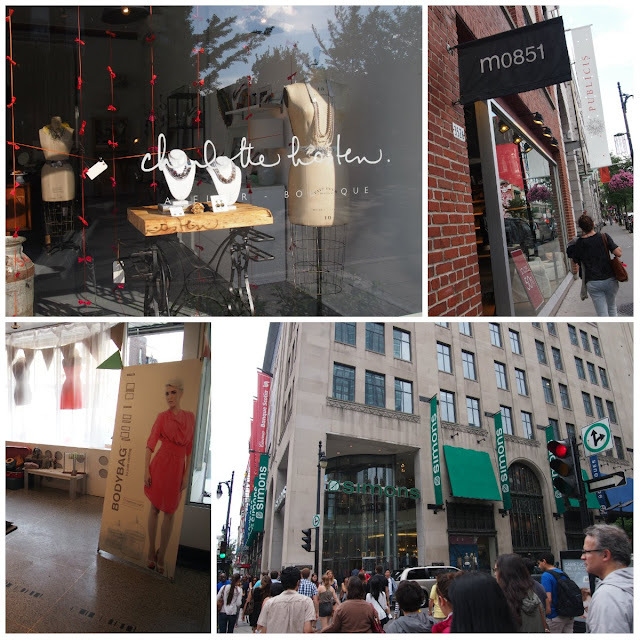 It's the birthplace of some of our favourite North American brands and it's no wonder; Montreal has a rich history in the garment industry and continues to support local design today through government, grass roots and even corporately sponsored initiatives like Festival Mode Design, a 4 day fashion festival in the streets of downtown Montreal featuring both major brands and rising labels. If you're a lover of leather like I am, M0851 is heaven. While you can find the brand here in Toronto (check Yorkville or Bayview Village), the selection on Rue St. Laurent is a treat for the senses featuring buttery soft leathers and interesting silhouettes that only get better with age. If you're unsure of which chic leather backpack, tote or moto jacket you want to take home, ask the staff to share one of their well loved pieces so you can get an idea of how yours might look with age. Each investment piece is designed to look even better in the years after you bought it. 3526, boul. St-Laurent, Montréal. (514) 849-9759. Even if your French isn't fab, you'll have no problem sharing your love of baubles inside Charlotte Hosten's Atelier Boutique. The talented, self-taught designer takes unique beads, brooches and fabric collected from travels or rescues them from past lives (i.e. upcycles) and includes them in mixed media bib necklaces, bracelets, hair accessories and more. 122 Bernard West, Montréal. (514)274-8511. Classic meets street style at Bodybag by Jude Clothing and while the sizing is a little euro (read: snug) the unique collection within might just be worth having one less croissant. Harem pants, cut-out details, and more await but the accessories are just as interesting so leave yourself enough time to explore every nook and cranny of this tiny treasure trove. 17 Bernard West at the corner St. Laurent, Montreal. 514.274.5242. Simons has been a fixture on the Quebec fashion scene since the 1800s but never made it to English speaking Canada until earlier this year with the opening of a location in West Edmonton Mall. In traditional department store fashion you can expect multiple levels of style for the whole family including several exclusive labels including Twik and Icone, that are worth taking a look at. You'll also find department store like sales to boot. 977 Sainte-Catherine Ouest, Montréal. 514-282-1840. While my other picks are Quebec born and bred, Axara, an import from Paris was my total "SCORE" shopping moment as I happened upon an awesome 70% off sale...Hello! Or shall I say, Bonjour? Think effortless French elegance with trends incorporated just so, every piece is of the moment but yet a wardrobe addition you'll wear for seasons to come. 3652 Boul. St. Laurent, Montréal. 514-849-6262.